My gods are mass-produced, disinterested, mostly ignored. 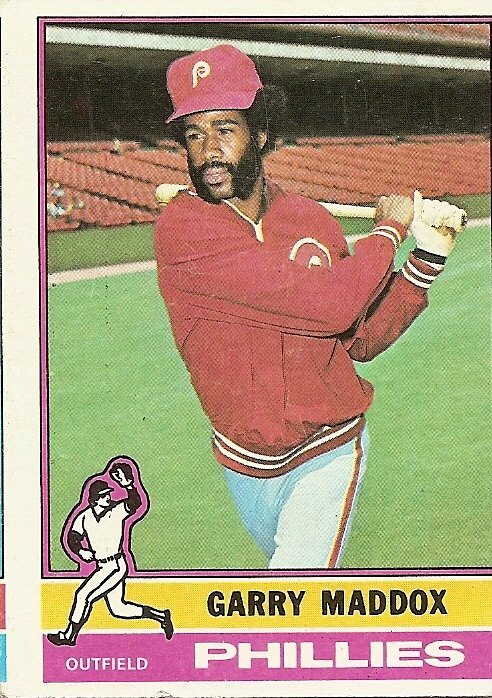 Note the left-hand fringe of this 1976 Garry Maddox card: it is a cutoff border of another card, possibly for a member of the Texas Rangers. I was generally able to embrace the illusion that each card I got in a pack had come into existence in some sort of singular burst of creation, something meant to end with the deliverance of the card to my hands, but cards like this suggested huge sheets of cards spitting out of machines to be sliced into many rectangles by other machines. I didn’t like the idea of huge sheets of cards. It seemed to suggest I didn’t matter. But gods will not give you what you like. And note the look on Garry Maddox’s face. Does he seem to care that he is to serve as one of the figures in my ever-expanding pantheon of gods? No, he clearly has his mind on other things. Gods will not be thinking of you. And note the empty seats. There are just a few figures in the stands behind Garry Maddox, but even they seem more likely to have their minds on anything but the random moment unfolding in the foreground. This is a realm where nobody cares. A mass-produced image of a disinterested man taking a phantom swing in his warmup jacket in front of empty seats and apathetic soltaries. The back of his card should include the koan about a tree falling in the forest with no one around to hear, but instead it shows years stretching backward (years always stretching backward with my gods) to his time with the Giants, when he was on the same team with the confusingly similar Gary Matthews, as if the Giants in the days before I was really paying attention were a primordial ooze where one god merged into the next. Note that as the years went on I learned the difference between Garry Maddox and Gary Mathews, so much so that I forgot I’d ever confused them, and in doing so lost some of the connection to the mystery of the gods. But also note, above all, Garry Maddox’s muttonchops. Thanks and praises for Garry Maddox’s muttonchops. If a man swings in a ballpark and nobody cares, does it matter? That’s the koan for the day. My answer: muttonchops. You are currently browsing the archives for the Garry Maddox (Phi.) category.